Ohio sophomore Cameron Odom breaks away from a pair of Howard defenders, during the Bobcats’ win on Sept. 1 in Athens, Ohio. OXFORD, Ohio — A little bit of Red back in the rivalry. 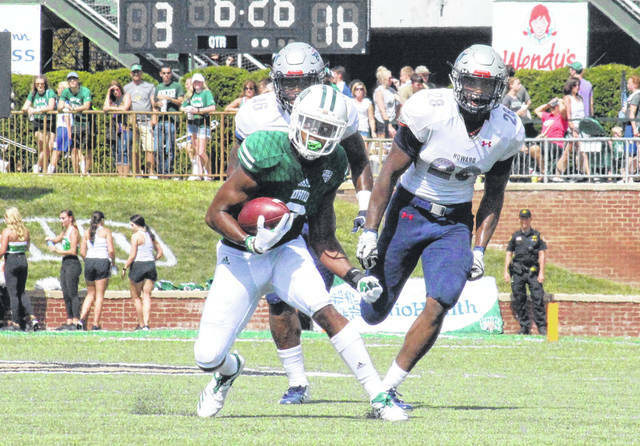 For the first time since 2012, the Ohio football team fell in the Battle of the Bricks, with Mid-American Conference host Miami ending a five-game skid against the Bobcats with a 30-28 victory on Wednesday at Yager Stadium. Ohio (6-4, 4-2 MAC) — which had won three consecutive games headed into Wednesday — scored on the game’s opening drive, covering 74 yards in six plays, with senior Maleek Irons delivering a three-yard rushing touchdown. Louie Zervos made his first of four successful point-after kicks, giving the Green and White a 7-0 edge with 11:11 left in the period. Miami (4-6, 4-2 MAC) answered on its first offensive possession, going 73 yards in seven plays with Alonzo Smith running into the end zone from three yards out. Sam Sloman’s first of four extra point makes tied the game at seven with 8:16 left in the first. Ohio covered 28 yards in seven plays on its next drive, but ultimately punted for the first of five times in the game. Following a three-and-out by each side, the RedHawks took a 14-7 lead with a 12-play, 71-yard drive, finished by a 16-yard Kenny Young touchdown run at the 11:12 mark of the second quarter. Another Bobcat three-and-out was followed by another Miami scoring drive, with a 12-yard touchdown pass from Gus Ragland to Luke Mayock capping off an seven-play, 71-yard drive, giving the hosts a 21-7 edge with 6:32 left in the half. The Green and White fumbled the ball away on their next offensive try, with Brad Koenig stripping the ball and Myles Reid recovering for the RedHawks. Five plays later and 48 yards later, Miami’s lead was at 28-7, as Smith scored on an eight-yard run with 3:44 left in the half. Ohio punted on its final drive of the first half, but forced a three-and-out to start the second half. After punting for the final time in the game, OU came up with its first takeaway, as Jared Dorsa intercepted a pass near midfield. Following the interception, Ohio covered 46 yards in nine plays with Papi White catching a nine-yard touchdown pass from Nathan Rourke, trimming the deficit to 28-14 with 2:32 left in the third. Ohio forced a three-and-out and then covered 60 yards in six plays, only to miss a 29-yard field goal attempt in the opening minute of the fourth quarter. The Bobcat defense forced Miami to punt again on the ensuing drive. This time Dorsa blocked the punt and Dylan Conner returned it 28 yards for a touchdown with, cutting the MU lead to seven 9:05 to go. Next, Ohio’s defense came up with another three-and-out, but MU punter Kyle Kramer pinned the Bobcats deep in their own territory with a 47-yard punt that traveled out of bounds just one yard in front of the end zone. OU made it as far as the five, but on third down, Doug Costin came up with a sack and a safety, making Miami’s lead 30-21 with 5:52 to play. Ohio forced a three-and-out, and took over with 80 yards in front of it and 4:40 to play. The Green and White needed just seven plays and 2:16 to cover the distance, pulling within two points with an 18-yard touchdown pass from Rourke to Andrew Meyer. The Bobcat defense came up with the three-and-out it needed, but Ohio had just 30 seconds to cover 89 yards and ran out of time, falling by a 30-28 count. For the game, Miami claimed a 19-to-16 advantage in first downs. MU converted 8-of-15 third downs, while Ohio was 6-of-14 on third down and 1-of-1 on fourth. The Bobcats earned a 364-to-357 advantage in total offense, with a 201-to-158 edge on the ground. The turnover battle was even at one apiece, and the RedHawks claimed an advantage of over seven minutes in time of possession. A.J. Ouellette led the Bobcat attack with 197 total yards, combining 15 carries for 168 yards with three receptions for 29. Rourke was 16-of-27 passing for 163 yards and two touchdowns, while carrying the ball 13 times for a net gain of 16. Irons carried the ball four times for 17 yards and a touchdown, White caught five passes for 44 yards and a score, Cameron Odom added four receptions for 31 yards, while Meyer had three receptions for 34 yards and a touchdown. Ohio’s defense was led by Evan Croutch and Kylan Nelson with nine tackles apiece. Four of Croutch’s tackles were for a loss, including his team-best two sacks. For Miami, Ragland was 20-of-32 for 199 yards through the air, with one touchdown and one interception. Smith had 94 rushing yards on 20 carries to lead the RedHawks. Young combined seven carries for 38 yards and a touchdown, with a team-best seven receptions for 67 yards. The Bobcats are back in action at home on Wednesday, with MAC East leading Buffalo visiting Peden Stadium. Kickoff is slated for 7 p.m. and the game will be televised on ESPN2.